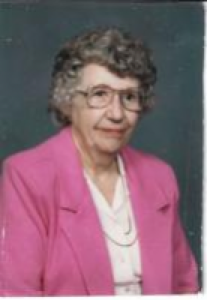 Lucille Josephine Meyer, 96, died at the Fair Haven Shelby County Home, 2901 Fair Road, Sidney, Ohio, on Thursday, September 4, 2008 at 8:05 AM. She was born August 12, 1912 in Newport, Ohio the daughter of Nicholas and Ella (Gigandet) Simon. She was married in 1930 to Louis J. Meyer and he died in 1939. Surviving are four children, Richard and wife Barbara Meyer of Piqua, Ohio; Omer Meyer of Greeneville, Tennessee; Delores Ludwig of Sidney, Ohio; and Marlene and husband Landon Wilds of Greeneville, Tennessee; ten grandchildren, Vicki Sue Anderson, Kimberle Fowler, Tim Ludwig, Peggy Kiehl, Terry Ludwig, Steve Ludwig, Billy Joe Wilds, Sharlene Wilds, Gary Wilds and Lisa West; fourteen great-grandchildren and and five great-great grandchildren. Three brothers, one sister and one grandson are deceased. She was a member of Holy Angels Catholic Church in Sidney and had worked at the former Hillcrest Nursing home, now the Pavilion Nursing Home in Sidney. A Mass of Christian Buriwl will be held on Monday, September 8, 2008 at 10:30 AM at Holy Angels Catholic Church with Rev. Dan Schmitmeyer. Burial will be at St. Peter and Paul Cemetery, Newport, Ohio. Friends may call at Salm-McGill and Tangeman Funeral Home in Sidney on Sunday, September 7, 2008 from 2-4 PM and on Monday at the funeral home from 9:30 AM until 10:15 AM. Memorial contributions may be made to the Fair Haven Shelby County Home, Alzheimer&#39;s Unit, Timber Hall, 2901 Fair Road, Sidney, Ohio 45365. Envelopes will also be available at the funeral home.